In Maryland and Washington, DC, winter weather can bring snow, ice, and slush. Because of this, winter is hard on your concrete floors. Every time you drive your car into your garage, you track in snow, slush, and salt. These items can damage your floors, leading to cracks that are costly to repair. Floor coatings can protect your concrete floors from these and other winter risks, giving your floors a longer potential lifespan. Here is a closer look at some of the benefits of floor coatings in the winter when you have concrete floors. Do you really want to spend the cold winter months washing your garage floor? Of course not, but if you don’t the grit and grime you track in on the wheels of your car will leave the floor looking dull and dingy. This hurts the aesthetics of your garage and will create a much harder cleanup job when the spring weathers come. In fact, the salt and slush that gets tracked into your garage in the winter can actually stain your concrete. Because of concrete’s porous surface, this dirt is more than just surface deep, leaving you with a lengthy cleaning process. Concrete floor coatings are much easier to clean, protecting the look of your concrete. Salt that gets tracked into your garage can actually seep into the porous concrete surface. If it is not properly removed, it will cause cracks and other structural problems, leaving you with a costly repair need. You cannot keep the salt out of your garage in the winter, but you can keep it away from the concrete by adding a hard, protective coating on top. Water is normally not a problem for concrete, but in the winter, it can create serious issues. Water can seep into the concrete as it drips off of your tires. When the temperature drops and the water freezes, it will expand. This, then, hurts the structure of your concrete. Garage floor coatings protect the concrete from water, adding a water-resistant barrier to the surface of the concrete. As you can see, winter brings several challenges to your garage and other concrete floors. 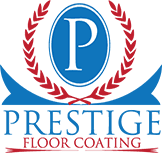 Concrete floor coatings from Prestige Floor Coating can protect your concrete floors, improve their look, and ensure that they are ready to serve you well when the temperature starts to warm. If you are looking for the ultimate protection for your garage in Washington, DC, Maryland, Virginia, Delaware, or Southern Pennsylvania, give us a call at (443) 519-2628 or contact Prestige Floor Coating today.